It might not look like much, but this mess of mud, wood and shredded plant bits is the product of some serious labour on Phil and my part over the past few weeks.We've weeded, hacked out tree stumps, dug out weeds, dug out more weeds, chopped down weeds and basically done nothing much more than weed. I have developed a profound and passionate loathing for the following plants: cotoneaster, montbretia, holly, honeysuckle, radiata pine and English ivy. 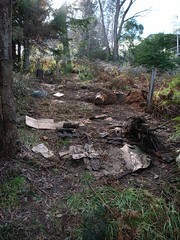 With the help of some bush rock and major earthmoving, this scene of carnage will soon be a nicely terraced vegetable garden. For those who've ventured up the back garden, this photo was taken standing behind the compost bins looking back up the hill.